Art has always been a vehicle for creatives to express their concerns about society, and male and female artists are taking on the Me Too movement as an opportunity to discuss a long-standing inequity within America. From political dissent to personal healing, creative expression can be a weapon or a balm. Ai Weiwei creates art to address the Chinese government’s corruption. Kendrick Lamar writes poetry to highlight American’s police brutality against black bodies. And Kesha creates music to explore trauma and healing from emotional and sexual abuse. All three artists create powerful messages about what’s happening in their world through art. So, when the Me Too movement took off last Fall, artists began creating meaningful work in response. Tarana Burke started the Me Too movement in 2006; its stated purpose was to “help survivors of sexual violence, particularly young women of color from low wealth communities, find pathways to healing.” When Alyssa Milano sent a tweet on October 15, 2017, asking people to respond with #MeToo if they’d faced sexual harassment or abuse, the phrase went viral. Just as quickly, male titans of the entertainment industry – starting with Harvey Weinstein – fell to grace as their abusive pasts came to light, thanks to actors like Ashley Judd, Rose McGowan, and Salma Hayek, who began speaking out about their experiences. In this article, we’ll meet five very different artists who felt compelled to create artwork responding to the Me Too movement and learn what inspired them to create and what they hope the work will achieve. 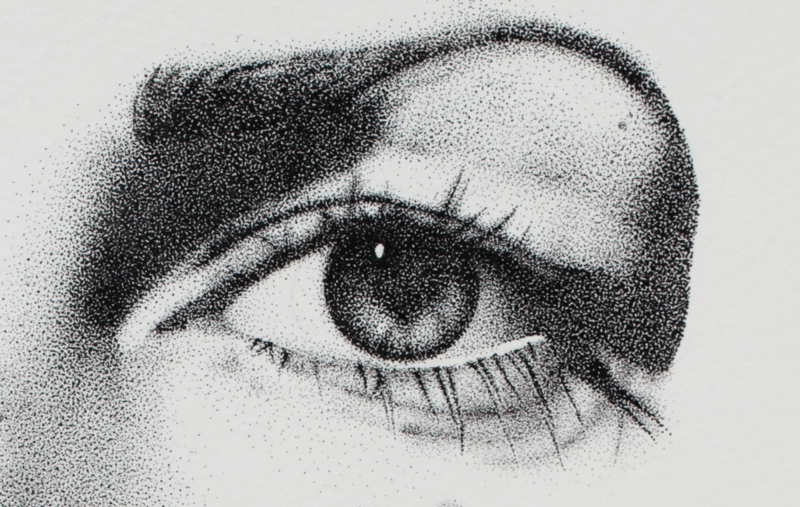 Claire Salvo is an L.A.-based visual artist who after experiencing sexual assault and witnessing the #MeToo movement felt inspired to create a stippling portrait series called ME:WE. Speaking to Artrepreneur, Salvo says the series, “tells the stories of nine women who have been sexually assaulted.” Her hope she says, “is that women find community, connection, and power in these stories.” Salvo also hopes the work and the courageousness that each woman has shown by sharing her story is contagious. Healing for others is important to Salvo, but the project has also been a step in her own healing process. When she was first assaulted, it took her nine years to come forward and share her story publically. Sharing her story was the first step in healing and now ME:WE plays an important role. She says, “reading, internalizing and translating each woman’s story challenges me to confront my own trauma.” Two pieces of ME:WE are currently on display at the Orange County Center for Contemporary Art as part of a group show called “It’s Time.” To stay updated on where to view the pieces, follow @clairesalvo on Instagram. Isaacs doesn’t have experience with sexual harassment or assault, but what struck him to create was the scale of his own friends’ #MeToo acknowledgments. 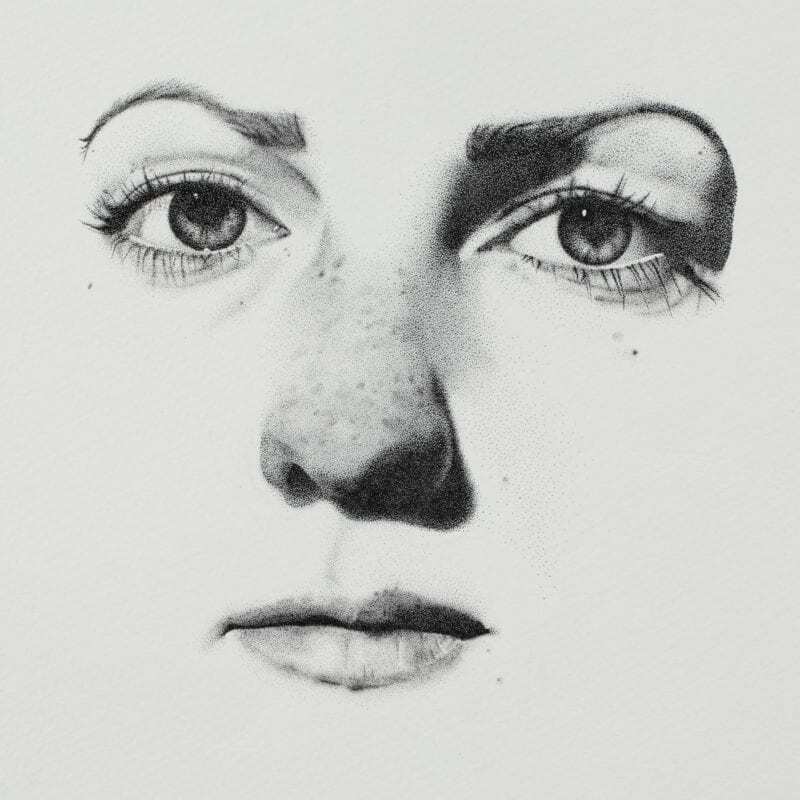 Steve Isaacs is an illustrator based in L.A. 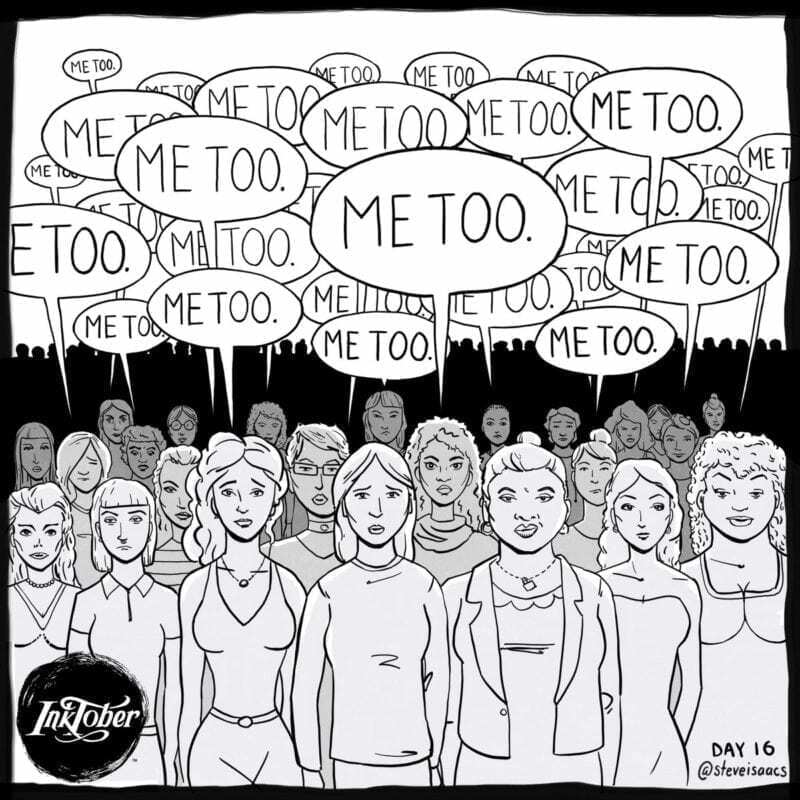 He was in the middle of an annual illustration challenge called Inktober when the Me Too movement burst onto his social media feeds. He tells Artrepreneur, “It started with just a few mentions on Twitter, then more and more, then later on Facebook, I was shocked to see an entire ocean of #MeToo’s from friends, colleagues, and family. It was just everywhere.” After seeing the movement’s scale so up close, he decided to skip the month’s prompt and illustrate what he was seeing. Isaacs doesn’t have experience with sexual harassment or assault, but what struck him to create was the scale of his own friends’ #MeToo acknowledgments. “What really hurt as the #MeToo’s began to flood in was they weren’t coming in a smattering here and there, but from the overwhelming majority,” he says. “I only created an image to show support of the movement, but my true deep respect and admiration goes out to everyone – women and men, who boldly chose to come forward with their admissions,” he adds. Writing for Lenny at the time of the single’s release, she said, “I hope this song reaches people who are in the midst of struggles, to let them know that no matter how bad it seems now, you can get through it.” At the time, no one could have predicted what would come next. Within months, the Weinstein story broke and Kesha’s “Praying” quickly became an anthem for survivors. At the Grammys in January, when the music industry was finding its place among the seismic shift taking place in Hollywood, she performed the single alongside Cyndi Lauper and Camila Cabello to make a powerful statement in support of the Me Too movement. To watch Kesha’s performance of “Praying” at the 60th Grammy Awards, click here. While fighting a legal battle with her former producer Dr. Luke, whom she claimed sexually and physically abused her, fans and allies rallied behind her. “Once I saw what the graph looked like, I realized it was important to show people – it was a massive human network,” she says. Typically, Gallagher focuses her work on conversations surrounding political networks. She explains, “I try to visualize the artificial amplification to show that a certain topic is being targeted and manipulated. Conversations on social media are abstract, so it’s hard to understand the scale of things without visual aids.” It’s been nine months since she created the #MeToo graphs at the peak of the movement and today, she still has individuals reaching out to learn more or buy them as prints. You can find more information about Gallagher’s data visualizations through her Medium blog. “I started the project as a way of showing my male friends the kind of things we would have to put up with, as they never used to believe the scale of the issue when we spoke about it in group situations,” she says, “However as the project grew, it became more than just raising awareness.” Today, “Cheer Up Love” has become a global platform for women to find solidarity and strength. 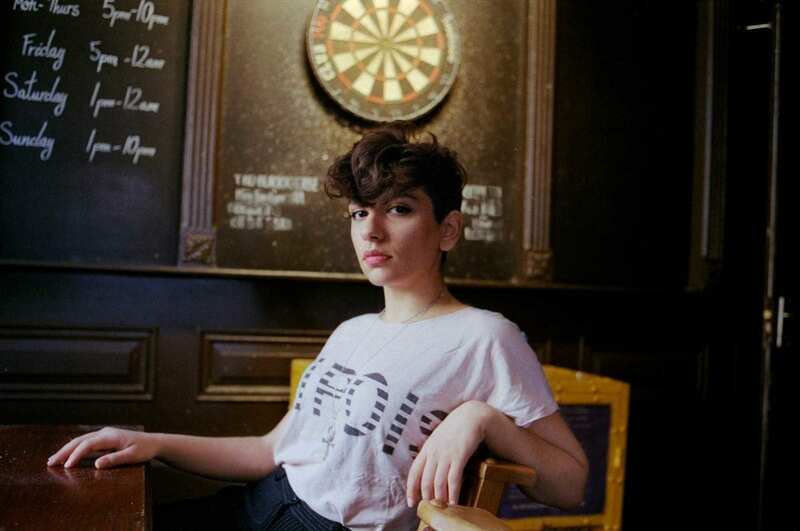 “The support from men and women for the project has been immense, and encourages me to continue my work.” Hatch intends to expand the project and encourages anyone with a story to reach out to her on Instagram @cheerupluv. It’s been 12 years since Tarana Burke launched the movement and only nine months since it’s become popularized on Twitter. We’re already seeing waves of culturally responsive and sensitive work by artists of all types. The technical work to understand how human movements like #MeToo unravel across the world by creatives like Erin Gallagher will help social scientists develop a deeper understanding of digital communication. Soul-baring artists like Kesha, Eliza Hatch, and Claire Salvo are inspiring women around the world to embrace their trauma and shed the darkness of doubt and shame by sharing their stories. And creatives like Steve Isaacs, who’ve haven’t experienced #MeToo themselves but see the effects in the faces of many of their friends, are adding angles of compassion and understanding to the conversation. The complexities of solving the problems addressed in the Me Too movement are vast and will take time. Like all movements, the individuals who comprise it are unique and come with life experiences of all types. Perspectives can bump against one another and paths to a creating a better culture can crisscross. Creative expression creates a valuable space, a pause in between those conversations to be vulnerable, expressive and understood. That is why art in the Me Too movement is critical and only just beginning.